Finally! The Quad Mama gets to answer some questions! Thank you all for your thoughtful and fun questions. Ashley really enjoyed reading all of these! Hopefully she picked out some fun ones to answer on this blog! We’ll have to do another one from all the content you provided! LOL. Here we go! -Which set of the quads does Ashley think look like her the most? I think Indie and Esme really look like me when I was their age. I’ve recently been looking at some old photos and I can pause and say “that’s Esme for sure!” Its fun to be able to look back at these and see resemblances. That’s why I love that we have documented so much! -Did Ashley Study? If so what? I have been a Master Esthetician for over 10 years! I did my training at Mandalyn Academy here in Utah. I’ve always had a desire and passion for skin care. My older sister is a Master Esthetician as well, so I got to learn a lot from her before I even started my official training. I worked for several years in a spa environment, and most recently running the med spa for a plastic surgeon’s office. Although the spa and medical atmosphere was fun, I have loved being able to use my talents at home running my own business and being with my kiddos! -How did you react when Ellen asked you to be on here show? Talk about the surprise of a lifetime! LOL, besides having quads right! I was incredibly surprised and excited! We love Ellen, and for her to reach out and ask our whole family to come be on her show was really something I never thought possible. It was such a surreal experience, and I was very nervous going on stage. But as soon as you sit down and start talking, she makes you feel like you’ve been friends for 20 years! It was such a fun experience and I’m so glad the entire family got to have that moment! Here’s the video that got us there! -Is it still medically possible for you to get pregnant? The doctor told me it would be a bigger miracle than having quads! LOL. I have stage 4 endometriosis, and it has compromised my ovaries as well as other organs. It is the reason we almost didn’t have our 4 miracles. God has been extremely giving in blessing us with our miracles. I think he knew the challenges and trials that went into us bringing our family here, and he gave us our miracles as a gift. He has a funny sense of humor doesn’t he? -If you found out your were having boys, what would their names be? Honestly, our boy list of names was incomplete. And by that, I mean non-existent! It was almost comical how things worked out because our girl name list was so long! I loved the name Grayson (Grey for short) though. It was probably at the top of my list. And I know that if I gave Tyson any sort of room to maneuver, he would have named one of our boys River. LOL. -If you could teach the girls one thing you want them to remember, what would it be? To love each other! I want to be best friends forever, and realize how important family is and the bond between sisters. They will go through this whole life together, and it warms my heart that they will always have each other. I hope that we can teach them how important loving one another is, and how importing it is to always be there for each other! -What is your favorite thing about Tyson’s relationship with the girls? -How did you meet the Revelli’s and The Binghams? Were they neighbors or college friends? Great question! They were actually neither. The Revelli’s were followers of ours since the beginning and had reached out to a mutual friend to introduce us. We had them over for a visit and they brought the girls all sorts of Peanuts swag (Stephanie’s Grandfather is Charles Schultz). Our relationship didn’t really bloom until we met the Binghams however, who were their best friends! We met the Binghams through email initially. Branden reached out and wanted to do a Youtube collaboration with our family. He mentioned the mutual friend of the Revellis, as well as the Steph and Adam for credentials I guess! LOL. I remember Tyson telling me “there’s this guy who wants to do a collab, he’s friends with the Revelli’s and James. I think he has a family channel, but his emails sound like he’s 16. If you know Branden, you know why Tyson said this! hahahaha. I still laugh about this. After we hung out a few times, we pretty much hit it off with both families and we’ve been friends ever since! -Did Ashley date anyone besides Tyson? Yes! I dated quite a bit. I even had a pretty serious boyfriend just before Tyson and I started dating. Tyson obviously changed my mind about that relationship. LoL. He loves to bring that up. I liked dating, but I loved Tyson! -When you got married, what was your first dance song? And why did you choose it? Our wedding song was “The way you look tonight” by Tony Bennett. If anybody knows Tyson, you know he is obessed with music. This was his choice, and of course I loved the words and music. It was just perfect for us! 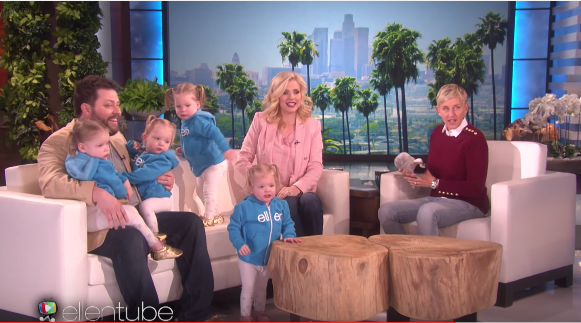 -What was your reaction to finding out your were having 4 little babies? Ill share these pictures and let them do the talking! -How many brothers and sisters do you have? I am the youngest of 5. 2 brothers and 2 sisters. -How do you deal with your endometriosis? This is such a complex question, with many chapters, so ill give the short version. When I finally was diagnosed, it was both relieving and scary. I was glad to know what I had, but also scared I couldn’t have children. The doctors methods seemed to help, but nothing relieved the pain or worry completely. Fast forward to the pregnancy, things got so much better. I had so many hormones with the girls, it suppressed the endo significantly. I haven’t had painful periods since then. God has blessed me because I know others are not that lucky. I still am on birth control to keep the the endo suppresses, and I think all the variables have helped me to deal with this awful disease. -How do you and Tyson stay connected with so much going on in your lives? It seems you have a really great relationship! The key is to make time for each other. We do have a lot going on in our lives, and we are great at delegating responsibility so things even out for us. But I would say the key to our survival is making time for each other. 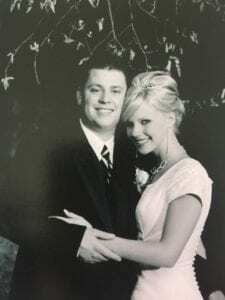 Every married couple needs time away from the kids to reconnect and remember why they do what they do every day. Romance is important. Feeling loved and appreciated is important! Knowing your spouse desires you and wants to be with you is important. All of these variables make it easy to juggle the rest of life! -What is your favorite memory from this year so far? The Jackson Hole trip hands down. Not because it was the most recent, but because so many fun memories were made and the girls absolutely loved the adventure! I could relive that trip forever! Ill attach the vlog here. I’ve loved these fun questions everyone gave. I hope you enjoyed my answers! Tyson has attached all of the blogs below in case you missed one! We LOVE all of you so much!